Emory is competing in STAT Madness, a "March Madness" style bracket contest for biomedical research. Please vote! See below for details. 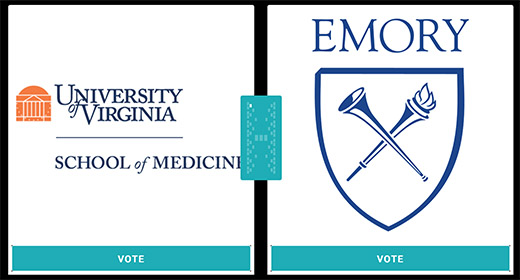 Emory is participating in STAT Madness, a “March Madness” style bracket competition featuring biomedical research advances instead of basketball teams. Universities or research institutes nominate their champions, research papers that were published the previous year. It's like "Battle of the Bands." Whoever gets the loudest – or most numerous – cheers wins. The original lineup included 64 entries, with the competition starting March 4. After Emory beat out Vanderbilt University and advanced to Round 2, there are 32. Emory is now competing against the University of Viriginia. Voters can fill out a whole bracket or just vote for Emory. Voting each week closes at midnight on Thursday. It's like the "precogs" who predict crime in the movie Minority Report, but for sepsis, the deadly response to infection. Shamim Nemati and colleagues have been exploring ways to analyze vital signs in ICU patients and predict sepsis, hours before clinical staff might otherwise notice. As landmark clinical studies have documented, every hour of delay in giving someone with sepsis antibiotics increases their risk of mortality. So detecting sepsis as early as possible could save thousands of lives. Many hospitals have developed "sniffer" systems that monitor patients for sepsis, but this algorithm tries to spot problems way before they become apparent.